Orioles 8, Red Sox 1 : Patriot Games – The Orioles homer twice & do not allow a HR for the first time this season as they rout the Red Sox on Patriots Day in Boston. 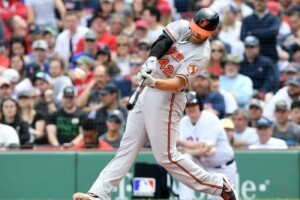 Dwight Smith Jr. homers (#3) & drives in 4 runs, Chris Davis adds a towering 2-run bomb of his own (#1) his first HR since last August as the O’s get the split @ Fenway. Dan Straily pitches 5 innings, allowing just 1 run on 2 hits & the bullpen takes over from there to close it out on what was also Jackie Robinson Day. The Orioles had lost 9 of their previous 11 & were 4-21 in their last 25 games against Boston coming into this series. Baltimore now heads to Tampa Bay for 3. Priceless Hoops, A Tiger & Seahawks…Oh My!